Everyone needs a hobby—even Apple. And Apple executives have repeatedly referred to the company’s Apple TV product as a “hobby.” But beyond that moniker, there’s been precious little information about how many Apple TVs Apple sells. 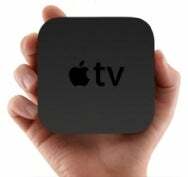 In October 2010 Apple said the company had sold 250,000 second-generation Apple TVs in a few weeks. And in late 2010 the company announced that the device was about to pass a million units sold. Since then we haven’t heard a lot, but on Tuesday’s conference call with financial analysts to discuss Apple’s quarterly results, CEO Tim Cook dropped some raw numbers. Answering a question about Apple’s future in the TV market from Piper Jaffray analyst Gene Munster, who has been suggesting for years that Apple is about to build its own TV set, Cook sidestepped that issue and discussed Apple’s $99 black box instead. That sounds impressive, but if you keep in mind that during that same period Apple sold 5 million Macs, 15 million iPods, 15 million iPads, and 37 million iPhones, you can see why it’s still a hobby. “In the scheme of things, if you [look at] the revenues, we still classify this as a hobby,” Cook said. Calculating the product’s $99 price, 1.4 million Apple TVs would generate less than $140 million in revenue. Compare that to $2.5 billion for the iPod, $6.6 billion for the Mac, $9 billion for the iPad, and $24 billion for the iPhone. But Cook was careful to praise the Apple TV and suggest the company is still avidly modifying it and analyzing the results.